“If something excites you, go for it.” We love hearing stories of makers who dives right into a craft that excites them and turn it into their own business. Macramé artist, Angela Holm, chanced upon a macramé wall hanging on Pinterest 2 years ago. Thinking that it would be fun to make one herself, she taught herself some basic macramé knots, made her first hanging planter and never stopped! With her mum being her greatest inspiration, Angela creates macramé pieces ranging from large wall hangings to earrings and coasters. 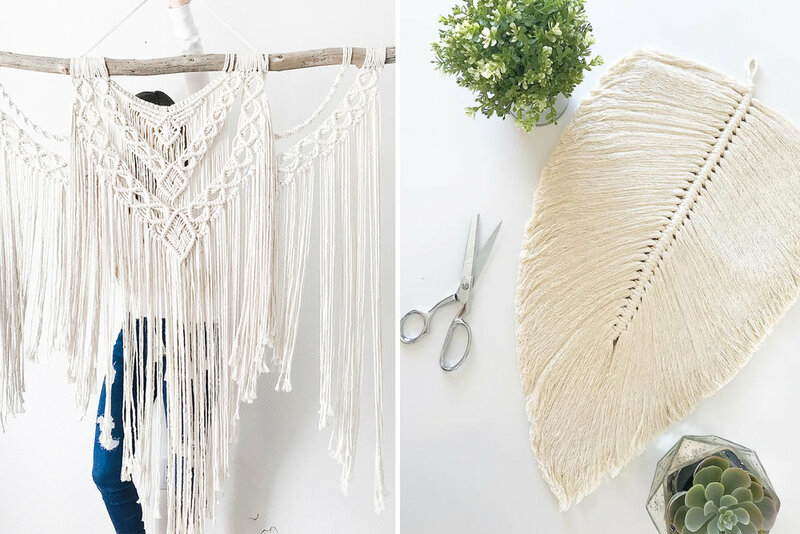 Her Etsy Store, HolmMadeMacramé, is the fruit of her effort and determination to chase after her dreams. We couldn’t let her go without getting some advice on how to switch crafting into a full time business. Read on to get inspired! Early riser or night owl… I would definitely say I’m a night owl since I have two children. I get most my macrame work done after they have gone to bed. A song to get you into the creative groove… I don’t have a specific song, but while I work I love listening to contemporary music or a motivating podcast/book i.e. Grant Cardone. What did you aspire to be when you were 5… I always wanted to be a wife and mother to many children! 3 essentials we can find in your bag… Burt’s bees chapstick, hand sanitizer and a goody hair tie. If you weren't a macrame artist, you would most probably be doing… I’d probably be doing a MLM business selling Crunchi cosmetics or essential oils! 1. Tell us about your background and what led to you choosing macrame as a craft. Growing up, I was always my mother’s most crafty daughter! I loved to sew, crochet, paint and do all sorts of creative things! After I got married, I wanted to have some kind of hobby (or my own business) and something that I just loved to do during my free time (since I am a stay at home mother as well). However, I didn’t want to rush into anything and end up not loving it. 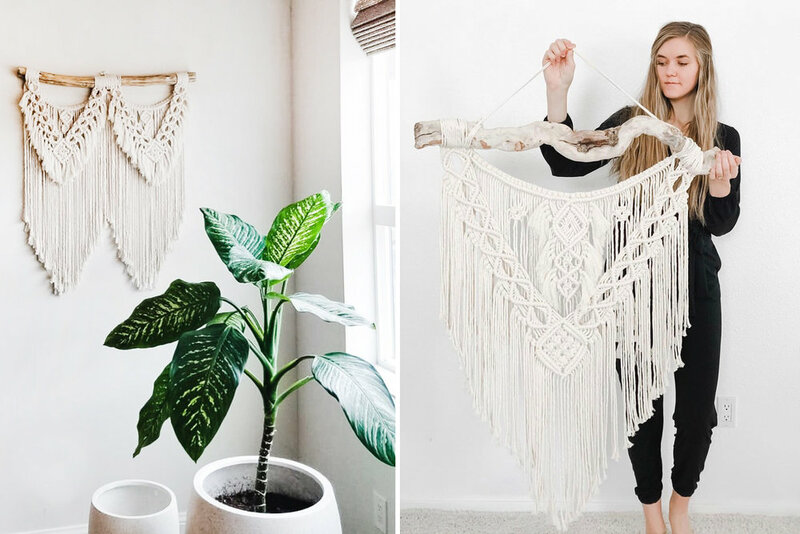 In 2017, I was on Pinterest and caught eyes on a Macrame wall hanging which I thought looked amazing! I would have bought one on the spot if I wasn’t living in a rented apartment that was already decorated. I thought it would be so fun to make one, but I honestly didn’t think I could do it. I actually taught myself the basic Macrame knots and the first thing I made was a plant hanger! I had so much fun making it and decided to purchase some more quality rope and made my first wall hanging! My mother is also a Macrame artist and she was my inspiration from the start. She’s the reason why I started my Macrame page on Instagram. I’m so grateful I did. I just loved the idea of having my own business from home. I opened my Etsy shop and I still work hard everyday to grow my business and share macrame with others. I find joy in it! 3. Tell us more about HolmMadeMacrame. My last name is “Holm” and it kind of sounds like “home”. And when I put it together it’s “HolmMadeMacramé”. My favorite materials to work with is the natural single strand, twisted cotton cord. It’s my favorite for wall hangings. But my favorite rope for plant hangers is the 3 strand twisted cotton rope! My favorite piece I made is my largest one! I had a beautiful piece of cedar wood and I just got creative with it! I kind of had an idea in my mind of how I wanted this piece to look and it turned out better than I had imagined! 6. How is the yarn scene like in Utah? I honestly don’t know of any makers in Utah. Mostly photographers! 5 days after I opened my Etsy shop and my Instagram account, I broke my right arm while snowboarding. I didn’t tell anyone though. It took me 6 weeks to recover so I got off to a rough start. I still posted pictures every day or every other day on my IG account and still did my best to grow my followers! 8. Advice for those wanting to switch into crafting full time? Make sure you’re very passionate about whatever crafts you’re into. And go for it! Just know that a successful business doesn’t just happen overnight. Be prepared to work very hard and show up everyday. I’d recommend you to read sales training books also and be very confident in your business. “Set targets for yourself that are 10X greater than what you believe you can achieve.” - Grant Cardone (I read a couple of his books and you’ll be amazed what you’ll learn about business and sales!) Good Luck!